Often the scene of many thrilling title deciders, the season-ending Brazil Grand Prix promises to be a momentous climax for a different reason. Sebastian Vettel, already crowned the 2013 world champion, is aiming to equal two milestones at the iconic Interlagaos - Michael Schumacher's 13 victories in a single season from 2004 and Alberto Ascari's nine straight grand prix wins recorded 60 years ago. Can anyone spoil the party for the German driver? The mixture of fast and slow corners, several elevation changes and the high-altitude level of the circuit all combine to make Interlagos one of the most technically challenging circuits on the Formula 1 calendar. The 4.309km circuit is one of the few that runs in an anti-clockwise direction and also has some pretty quick left-hand corners, consequently providing a different physical test for drivers who are not used to the significant G-force they will feel on the left side of their bodies. It is also the second-shortest lap of the year after Monaco, meaning drivers have little time to relax during the 71 laps. The circuit is narrow in areas, but there are at least four places where overtaking is possible, with the best two passing opportunities are at the Senna S and at the end of the pit straight. Scruffy and crumbling in places, Interlagos is an ageing circuit, but one that is full of character and loved by drivers and fans alike. Brazilian Grand Prix: What makes Interlagos so good? The name Interlagos roughly translates as "between lakes" which comes from the fact that it was built in a region between two large artificial lakes, Guarapiranga and Billings. It was renamed Autodromo Jose Carlos Pace in 1985 in honour of Brazilian F1 driver Pace, who died in a plane crash in 1977. Cut into a hillside, the natural layout of the circuit provides fans with superb views and over 50% of the circuit can be seen from the 65,000 capacity grandstands. 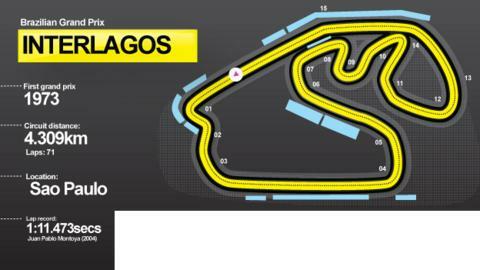 Interlagos in Sao Paulo is one of Formula 1's classic venues and it has provided many races befitting that status. A shortened and safer version of the magnificent five-mile autodrome at which F1 raced in the 1970s, the modern Interlagos retains the fundamental character of its predecessor, if not its extreme challenge. Twisting around a natural amphitheatre in one of the less salubrious parts of an edgy city where you have to be permanently on your guard, it repeatedly provides the great racing that many of F1's modern generation of tracks fail to. A short lap, a twisty infield and a long, curving pit straight ensure close battles and lots of overtaking. And it all takes place in an intense, steamy, claustrophobic atmosphere created by stands packed with some of the most passionate fans in the world. Ferrari driver Felipe Massa: "It will be very emotional racing at Interlagos for Ferrari for the final time. Just competing in the Brazilian Grand Prix is a dream for all Brazilian racing drivers. Winning [at Interlagos] is a feeling that is hard to describe. Winning here in 2006, in my first year with Ferrari, was definitely the most incredible race of my life. I had a special race suit featuring the yellow and green colours of our national flag and standing on the top step of the podium was more than I had ever expected from my life." McLaren driver Sergio Perez: "I love Interlagos because it's such a racer's circuit - you attack the whole lap. Every lap is a challenge and, when you're racing, an absolute thrill. I love it around here and I'll be giving it everything to make sure I finish the season in style." Lotus driver Heikki Kovalainen: "The fans are incredibly passionate about Formula 1. They're very knowledgeable and they turn the whole weekend into a giant party in the stands. It's pretty cool on Sunday when you're on the gird and all the stands are bouncing. It really is a cool place to race Formula 1 cars." Force India driver Paul Di Resta: "(The Brazilian Grand Prix) is one of the most atmospheric weekends of the year. The fans are the loudest and very passionate about Formula 1. There are drums playing in the grandstands and a party mood all the time. It's great to see and it definitely gives you a buzz. Because it's such a small track every hundredth and thousandth of a second becomes even more critical in qualifying." One of the most dramatic races at the Brazilian Grand Prix in recent history has to be the season-ending race in 2008. Like many before, the battle for the world championship went down to the wire, with Lewis Hamilton and home favourite Felipe Massa both arriving at Interlagos with a chance of winning the title. A win for Massa, coupled with Hamilton failing to finish inside the top five, would hand the Brazilian the world championship. That was the scenario as Massa crossed the finish line but, on the third-last corner of the final lap, Hamilton dramatically overtook Timo Glock to claim fifth place and ensure he snatched his maiden world title. Final practice, 12:55 GMT BBC Two, plus live text commentary online. Qualifying, 15:00 GMT BBC One, plus live text commentary online.